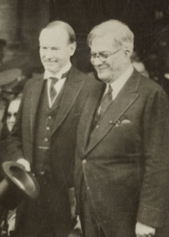 President Coolidge meets President Machado of Cuba, January 1928, during the Pan-American Conference in Havana. Coolidge is seen here meeting with a Knights of Columbus delegation to discuss religious freedoms in Mexico, at the summer White House, Adirondacks, 1926. From L to R, they are: Supreme Advocate Luke E. Hart, Deputy Supreme Knight Martin Carmody, Supreme Knight James A. Flaherty, President Coolidge, Supreme Secretary William J. McGinley, Supreme Director William C. Prout, and Assistant Supreme Secretary John Conway. 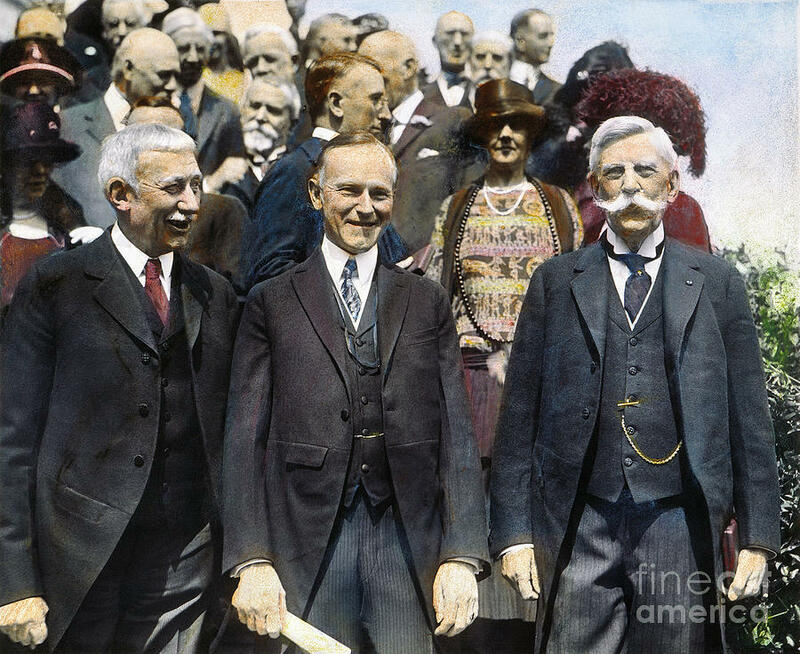 President Coolidge in color, flanked on his right by elder statesman-diplomat Elihu Root, who was dispatched to Europe to work out the World Court issue, and on his left by Justice Oliver Wendell Holmes. The President is presenting the Roosevelt Medal to them at the White House, June 2, 1924. Courtesy of Granger from Fine Art America. Professor Bear F. Braumoeller, a renowned statistician and researcher on international relations from Ohio State University, has a well-researched essay published four years ago in Foreign Policy Analysis refuting the gravely mistaken notion that America in the 1920s, especially during the Harding and Coolidge years, succumbed to isolationism. The caricature of the United States behaving like an ostrich burying its head in the sand has so conveniently conformed to what is accepted historical narrative that a consideration of what actually happened simply gets in the way. “Scholars,” a term I use loosely here, have simply not done their homework. Instead, as Dr. Braumoeller reveals, too many have echoed each other without bothering to account for the facts in the record, despite how irreconcilable they remain from the neatly packaged mischaracterization of the 1920s handed down all these years. 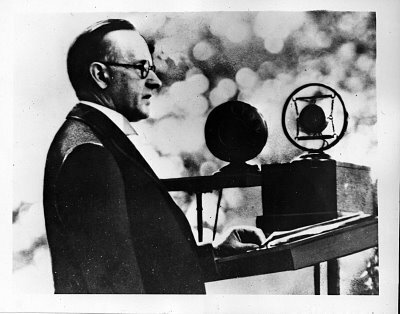 Professor Braumoeller answers the weak arguments made to “prove” the 1920s were isolationist — from rejecting participation in the League of Nations to the Neutrality Laws in the 1930s. 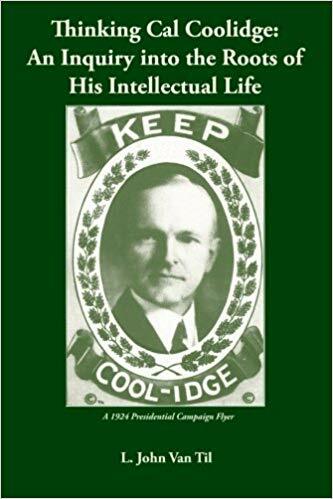 He discusses the Washington Conference in 1921-1922, the Ruhr occupation and the Dawes Plan, the “Peace Ultimatum” of 1925, and Kellogg-Briand Pact as just a few of the best known examples illustrating America’s active participation in world affairs. This only scratches the surface as the decade included the Locarno Treaty, officially establishing international relations on law and arbitration rather than military coercion, the Red Line Agreement concerning the settlement of oil development in Turkey, a Panama Canal treaty, the Tacna-Arica border arbitration, intervention in Nicaragua, response to the Philippine Independence resolution, the Geneva Conference, participation in maintaining China’s Open Door Policy, removal of the Roosevelt Corollary from the Monroe Doctrine, restoration of religious and property rights in Mexico, the Pan-American Goodwill Flight and the Pan-American Conference in Havana, just to name a few — all of which were carried out by the Coolidge administration. It is an unfortunate, yet avoidable, loss to accept the premise that the 1920s were naively isolationist and thus holds no lessons worthy of our attention. Instead of hastening from Wilson to F.D.R., we would do well to stop and study the Twenties. Times of war are hardly the only occasions from which to learn. After all, despite what some seem to believe, tanks and troop deployments are not the only kind of involvement there is in world affairs. It is misleading in the extreme to presume that if Americans are not marching armies all over the world, we are somehow deficient in our responsibilities. There is much to instruct us from times of peace. 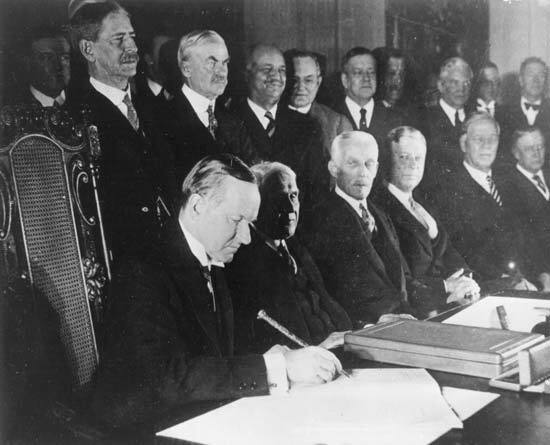 President Coolidge signs the Kellogg-Briand Pact, January 17, 1929, East Room of the White House. Courtesy of the Library of Congress. Members of the Pan American Conference to assemble in Havana, standing here on the grounds of the White House. 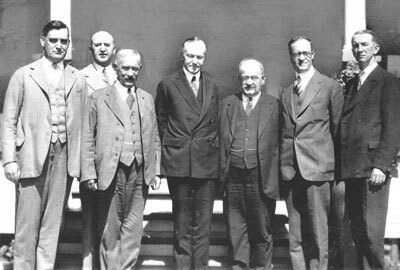 L to R, they are: Judge Morgan J. O’Brien, New York; Charles Evans Hughes; Secretary of State Kellogg; President Coolidge; Henry P. Fletcher, American Ambassador to Italy; former Senator Oscar W. Underwood; Dr. James Scott Brown, Washington; and Dr. L. S. Rowe of the Pan American Union. Courtesy of the Library of Congress. Comentarle que estamos publicando un libro acerca de la relación bilateral entre Bolivia y Estados Unidos. Consultarle si es posible que podamos utilizar (reproducir) la última fotografía de este post o que nos pueda indicar la fuente original. 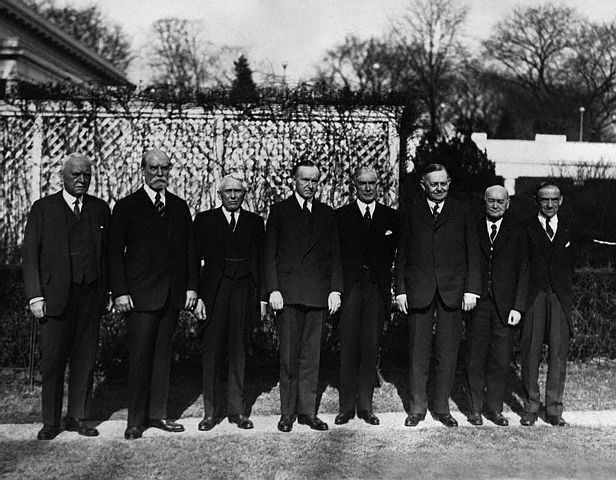 The source for this photograph depicting the members of the Pan American Conference on the White House grounds is the Library of Congress. While you certainly have my permission to cite anything from this article, please credit the Library of Congress for the use of this photo. I would be interested to support your project however I can. Thank you for inquiring. Please keep me informed of your publication’s progress.